WAUKESHA — As a point guard, Carroll University's Ray Pierce doesn't mind being the "center" of attention. "It's nice to have some attention sometimes, I must admit," Pierce said. "It's amazing how intelligent these kids are and can make us happy." But for Ray? This visit to Summit View Elementary School in Waukesha, brings back good memories. 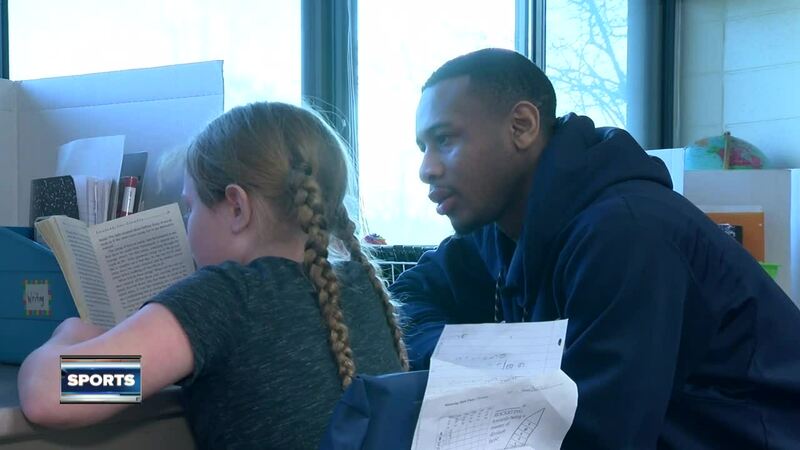 Pierce and his Carroll University basketball teammates give back, by reading with kids in the Sharp Literacy program. "It's been very beneficial for our student-athletes," Carroll Head Coach Paul Combs said. "It's extremely meaningful for the young people, but in turn Lance it's very beneficial for us." And like his leadership skills on the court, Ray feels led to lead in the classroom. Raised by his big brother and grandfather, mentors got him to today. "I'm the first one in my family to go to college and be a graduate," Ray said. "I just remember as a kid, I was struggling to read, and it would have been cool to read to college athletes. It would have been a great motivation." And now he's paying it back. "It's just nice to know you can have a positive impact on somebody's life," Pierce said before leaving the classroom.